I debated what my first recipe post should be. I wanted to do something really sweet and crazy and indulgent but then decided that with it being January and all you are probably looking for healthy but unique dinner ideas to pull you through the post-Christmas slump. I’ve got you covered. 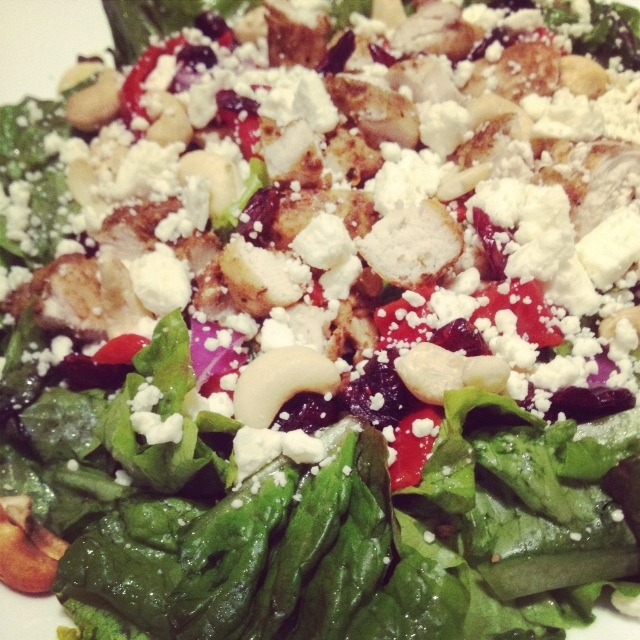 This salad recipe is inspired by one of my favorite restaurants in the city, Bocado’s. I used to find restaurant salads a little underwhelming but after being convinced by a friend who ordered it all the time, I tried this one and fell in love. I’ve ordered it countless time since. The salty, spicy chicken, the sweet cranberries, the creamy goat cheese and the crunchy cashews all marry together in the best way. The textures and flavors are so indulgent and satisfying. I’ve been trying to recreate this salad at home for ages. I knew all the ingredients so it couldn’t be that hard, right? Wrong. I could nail everything down to the chicken seasoning and without that it just didn’t satisfy my craving the same way. I looked up Moroccan spices and mixed them to make my own blend but still no dice. Then one day a few weeks ago, fate stepped in and an Epicure catalogue landed on my desk at work. I browsed through and when I saw that they had seasoning blends, I doubted they would have what I was looking for but took a peek anyway. They had a Moroccan seasoning! I ordered right away and when it came in, I got to work. Turns out, this was the missing puzzle piece and now I get Moroccan Chicken Salads whenever I want. Talk about a happy ending. Overnight, marinate the chicken breasts with the olive oil and Moroccan seasoning. Before you are ready to eat, heat a frying pan over medium-high heat. Cook chicken breasts on both sides until cooked through, adding seasoning salt to taste if you wish. Set aside on a plate to cool. To assemble the salads, put three cups of spring greens on each plate. Follow with the sliced cucumber, roasted red pepper and red onion. Then, slice the chicken and place on each salad. On top, sprinkle with the cashews, cranberries and finish off with the cheese. Drizzle with your dressing of choice. Enjoy! *Renee’s Sherry Herb or Spring Herb Italian Vinaigrettes are my favorites. I have also drizzled this salad with olive oil and herbs for a simpler dressing. Make it your own! Salad inspired by Bocado’s restaurant.